Everyone, I am so excited about this post, I can hardly stand it. 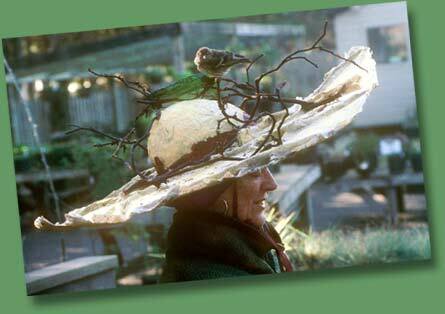 That's code for this might be a long one... We're having an Easter Bonnet Contest at the store. (Come in wearing your finest Easter Hat now through Easter to enter and win $100 gift certificate.) And while I am seriously grooving on the contest, it's just a prologue, the backstory if you will, to this post. 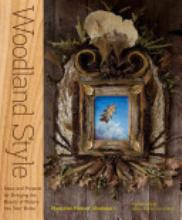 Since we're having the contest, we've all been thinking hard on hats and Chris was perusing the above most excellent book Woodland Style one day during her lunch break......She showed me a photo from the book of a woman wearing a hat and surrounded by birds. I thought it was a clever and fun photo, but when I dug a little deeper, turns out she's surrounded by birds because her hat is doubling as a birdfeeder! Be still my beating heart.